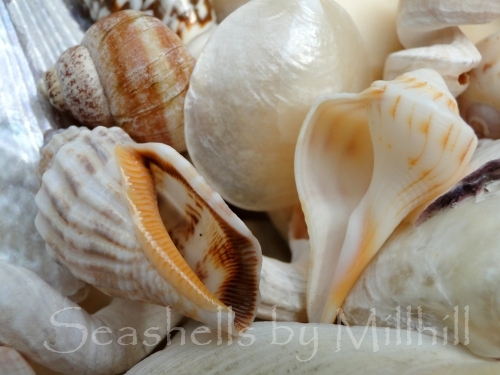 Not too long ago I was going through my seashell collection and came across this little shell again. The one pictured on the right in this picture to the left. I never knew what it was and then suddenly it hit me – a juvenile lightning whelk! 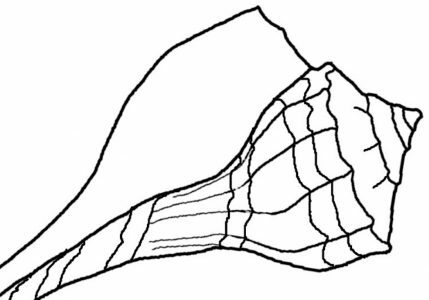 I knew because I finally looked long enough to realize that the opening is on the left side – it’s a sinistral shell! Then I looked at the lines and little bumps forming at the top and when compared to a more mature lightning whelk it’s easy to see that this one is just a baby – called a juvenile lightning whelk. So I have a mom and baby – but I highly doubt they are really related!! It’s just kinda cute. Photo below shows the two together. Sorry but I have to add my blog name because some unscrupulous people like to help themselves to my photos. So all my pictures are uploaded at a very low resolution and they are only good to use like this – for a blog. Please do not use photos that do not belong to you! Add Zemanta to your blog – it’s a great photo archive. I still don’t know what the other shell is in the photo above. Anyone? I think it’s a rock snail. Where did you find your lightning whelk shells ? These came from Sanibel Island, but I’ve seen them on the East coast of Florida – but they usually have hermit crabs living inside. Very cute baby 🙂 I looked through my guides and cannot identify the mystery shell either. Thanks for looking. I guess it will remain a mystery..!